Tomber dans les montagnes! Vous recherchez le week-end parfait pour une escapade à la montagne? Vous l'avez trouvé! Hêtre cabine est sur Beech Mountain à Banner Elk NC. Accès facile aux randonnées pédestres et cyclistes sur les monts Beech et Sugar. La cabine est à moins de 10 minutes de Grandfather Mountain. À une altitude de 4650 pieds, la cabine est à moins d'un mile de route au sommet de Beech et de la station de ski sur Beech, et à proximité Sugar est à seulement quelques minutes. 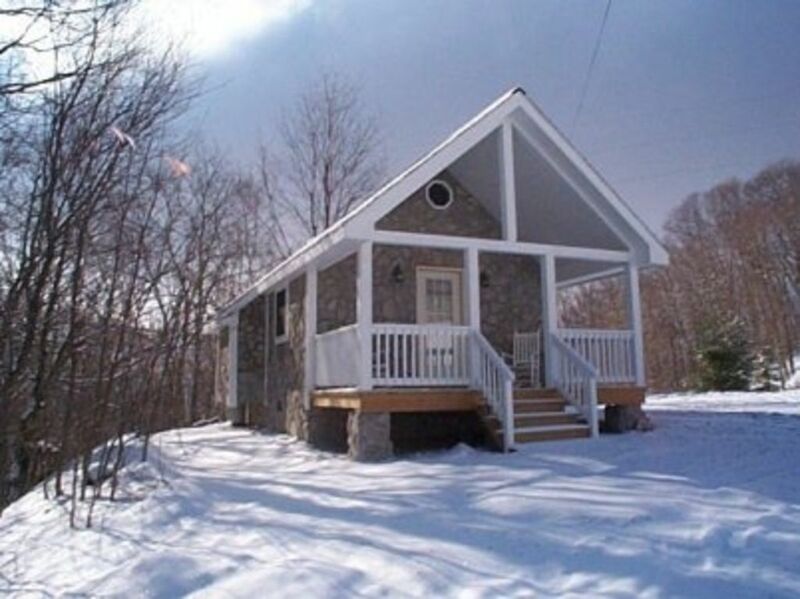 Beech Cabin est idéal pour un couple à la recherche de l'escapade de retraite parfaite hiver dans les Blue Ridge Mountains. Cette non-fumeurs, cabine les animaux de compagnie dispose de nombreuses fonctionnalités spéciales comme authentiques murs de pierre, les planchers de bois franc, couvert avant et ponts arrière et un flux outback se précipiter. Après une journée passée sur les sentiers, vous pourrez vous détendre dans le bain à remous. Avec câble tv lcd, wifi, et une cuisine complète, vous pouvez profiter du confort de la maison tout niché dans la petite cabane parfaite sur Beech Mountain. La cabine, construit en 2006, est très attrayant avec des plafonds voûtés en bois de cèdre et un traîneau lit king size. Profitez de l'air frais des montagnes des Highlands sur le pont avant ou écoutez le ruisseau et profitez de la nature pittoresque sur le pont arrière plus petit. De toute façon, se détendre et se détendre est facile. Si vous préférez rester à l'intérieur, une nouvelle unité de climatisation gardera la cabine aussi fraîche que nécessaire. La cuisine est entièrement équipée avec cuisinière, réfrigérateur tout neuf en 2018, lave-vaisselle, micro-ondes, cafetière et grille-pain. Ou vous pouvez préparer ces steaks ou des hamburgers sur le gril à gaz sur le pont arrière couverte. Montez la montagne pour les magasins de haut de la montagne et de l'activité de Beech Mountain, y compris Mercantile magasin de Fred, un favori personnel. Ou la tête en bas de la montagne pour pittoresques boutiques et de grands restaurants dans le centre de Banner Elk, comme Louisiana Purchase New Orleans restaurant de style, Stonewalls Steakhouse ou Banner Elk Winery. Sugar Mountain n'est qu'à quelques kilomètres si vous préférez Sugar. Nice, quick and close to surrounding "places to go." Easy to get to--road was well salted. Heater was on so the place was warm waiting for us. Had everything we needed. Clean and everything worked great. Clear directions from owners. Look forward to returning next year. Very pleased with this cabin and its location. We were central to everything! Great restaurants, grocery strore, small town and to the Beech Mountain Skiing Resort. Cabin was as described. Bed is super comfy! The lighting in kitchen was a little dim but we didn't really need to use it at night as we were eating out. I think the only complaint we had was where we parked the car, it was little muddy due to previous weather before we got there. Other than that we were pleased. I would definitely return and have already referred this cabin to a friend. Property was as discribed on the listing and cabin had everything provided that you would need to enjoy a weekend getaway. Unfortunately due to the inclement weather & bad roads upon arrival our stay was cut a little short because of an accident but we thoroughly enjoyed the night we did stay in the cabin. We would definitely recommend this cabin to others & look forward to staying there again soon. Beautiful for a couples weekend! Very close to great restaurants in Banner Elk! While the exterior of the cabin was charming, and it’s location pushed us beyond our typical Boone/Blowing Rock mountain cities boundaries, we were disappointed with the interior of the cabin and the front porch. The porch was covered with muddy animal and human footprints, not conducive to sitting out there and enjoying nature. Walking from parking area, the ground is muddy and there is no path or hard surface so your shoes are muddy, hence the porch. Entering the cabin, there was an obnoxious and overwhelming smell of cleaning solution (Pine Sol?) it permeated the entire cabin. The lighting in the cabin is bad. Trying to use the kitchen was a challenge with almost no lighting. The cabin advertises a jacuzzi tub, the jets are brown and not appealing in any way. We spent little time there and in fact left a day early.